An Introduction to this Series on the years 2009 – 2012 in conflict in Pakistan can be read here. This section deals with data available on Khyber Pakhtunkhwa and the FATA on an annual scale. We start with the annual scale for both areas and look at the monthly in the second part, trying to see where influences between KP and FATA can be judged. Like in all other provinces, major attacks in the Khyber Pakhtunkhwa concentrate on the Provincial capital (see Figure 1 and Figure 5). In Peshawar, like in Quetta and Lahore this amounts consistently to around 30% of all attacks. Only Karachi with 60% has a much higher share in Sindh. 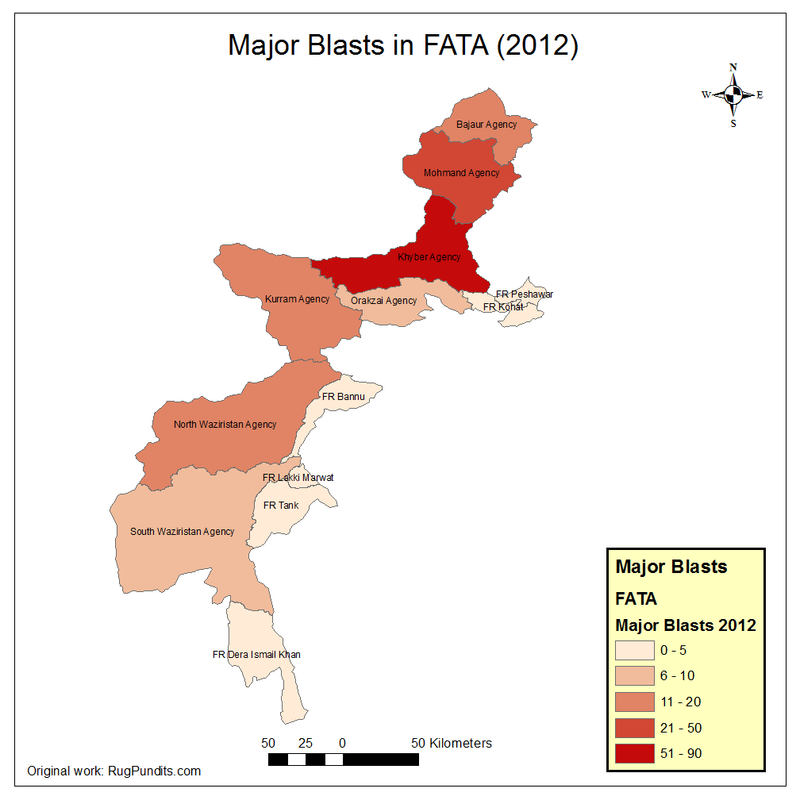 As is obvious from Figure 1, the area around Peshawar is generally the most heavily affected by blasts, especially major urban areas like Charsadda and Nowshera. It is surprising, that how amid violent districts, some tend to be not affected at all like Karak or Thor Gar for example. This may be due to their being less populous and hence less interesting for an effectful attack. 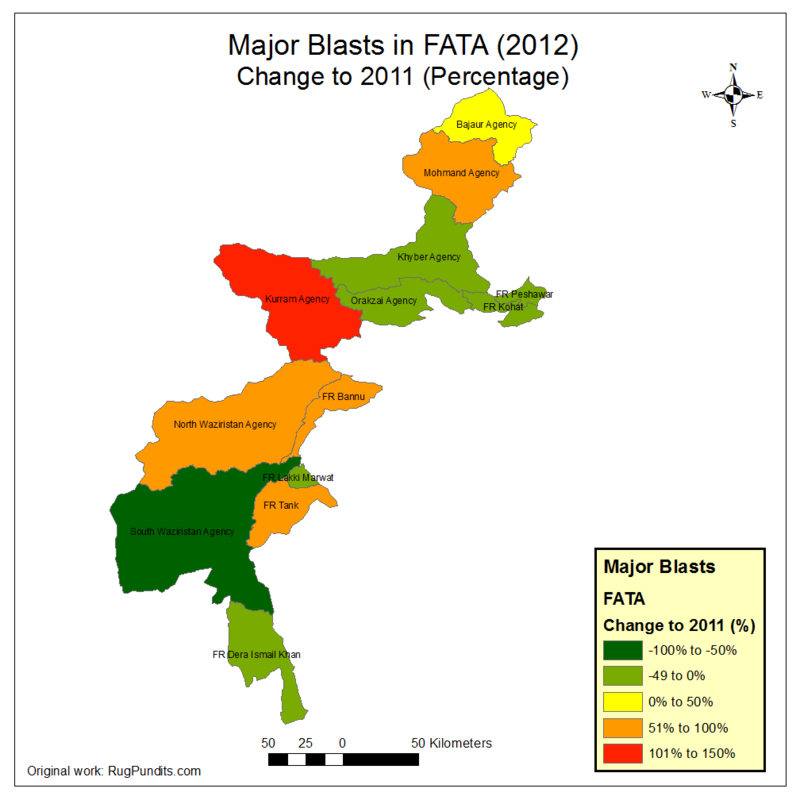 Compared to 2011 (see Figure 2), blasts increased especially in the south of the province (Lakki Marwat, Tank and DI Khan). These are bordering to South Waziristan and northern Baluchistan, areas that have rather become calmer compared to earlier years. With pressure and attention growing on Waziristan, the bordering districts may here be taking the brunt. Except for Dir and Mansehra, the northern parts have become calmer. 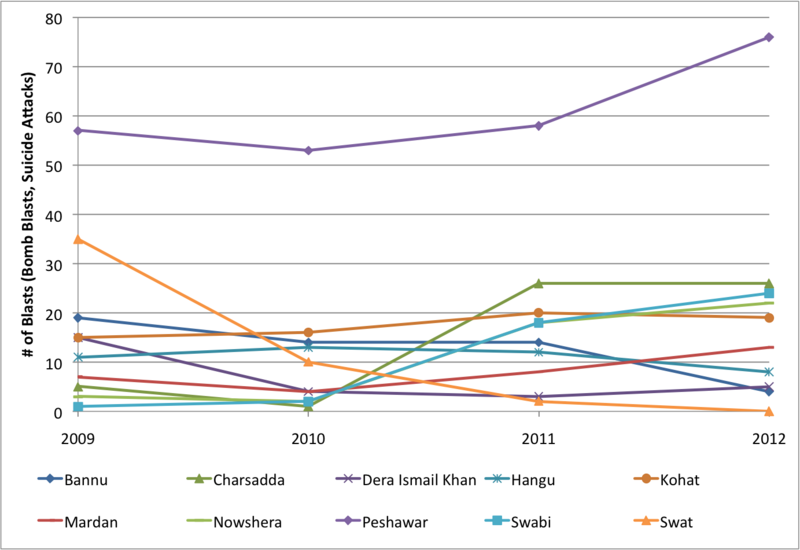 Peshawar, Nowshera and Swabi, already heavily affected have worsened even further. 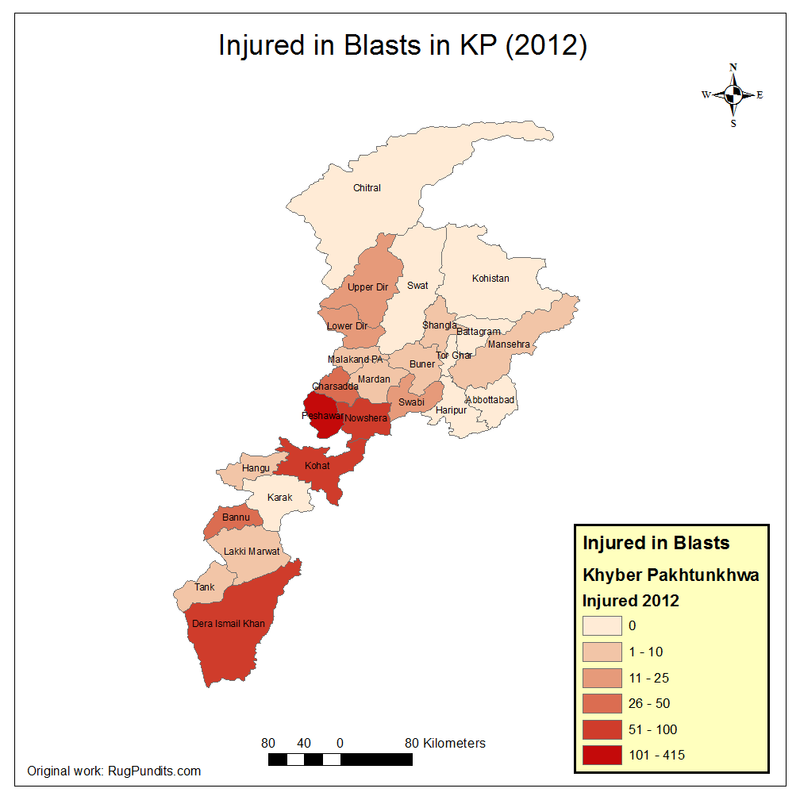 While total deaths are plotted further down, in Figure 3 we have used Injured to show the impact of blasts. While it is often people killed that remain in statistics, it will be the people often maimed by such attacks, that bear witness in decades to come to this violent period in the area. While in Tank it was largely the number of atacks having skyrocketed, these blasts were of less impact than in DI Khan, Lakki Marwat and Bannu. Also Kohat has been affected heavily in this regard. 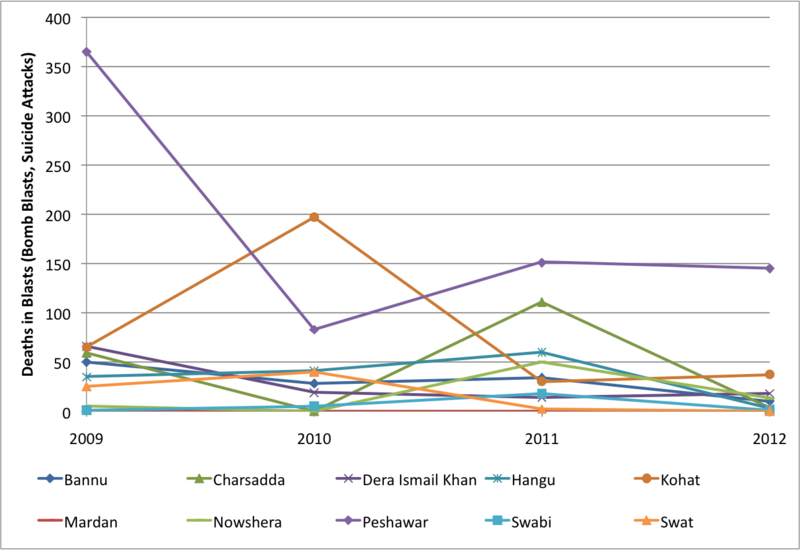 In recent years the number of attacks in Peshawar have risen (+36% in 2012 compared to the 3 year mean 2009-2011), while all over the province they stayed rather stable (+5%). It is noteworthy however while the ‘success story’ of Swat was down to 0 blasts in 2012, at the same time attacks rose in the neighbouring Swabi – a problem seems to have simply been shifted here. Many of the attacks in Swabi were however of minor scale (see intensities in Figure 6). Also attacks in Nowshera and Charsadda were on the rise. 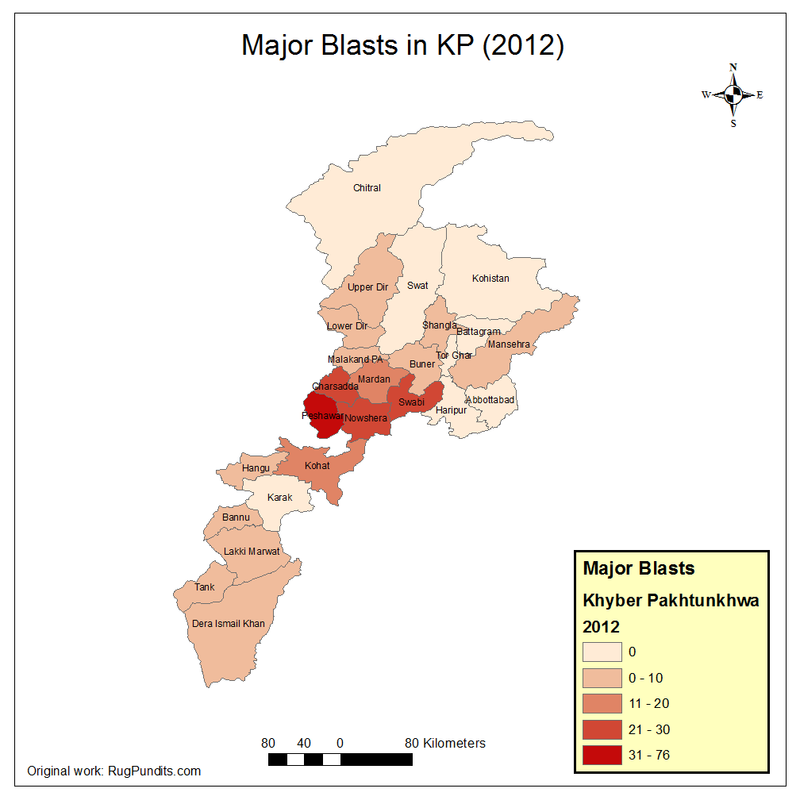 Figure 6 shows how especially in Lower Dir, blasts were of a very high impact even though rather few in number. The same is true for DI Khan and Lakki Marwat were attacks in recent years have gained some attention for their extreme attrocities. There are three areas were armed encounters are frequent between the Army and different insurgent forces. In 2009, the province’s major battle was going on in the Swat valley, reaching into the neighbouring areas of Dir to the West and Buner, Swabi and Malakand to the South. As is obvious from Figure 4, this conflict has subsided since. Numbers for Swat are not included in this graph, since they woul distort the presentation. In 2009 2240 people were killed there which was already down to 175 in 2010 and 0 in 2012. The largest share of these deaths are from Taliban groups, however also many civilians got into the crossfire, especially in Dir. The incidents which show how part of the daily life the war became here were children killed playing with toy bombs and farmers hit by shells while taking in the hay from the field. 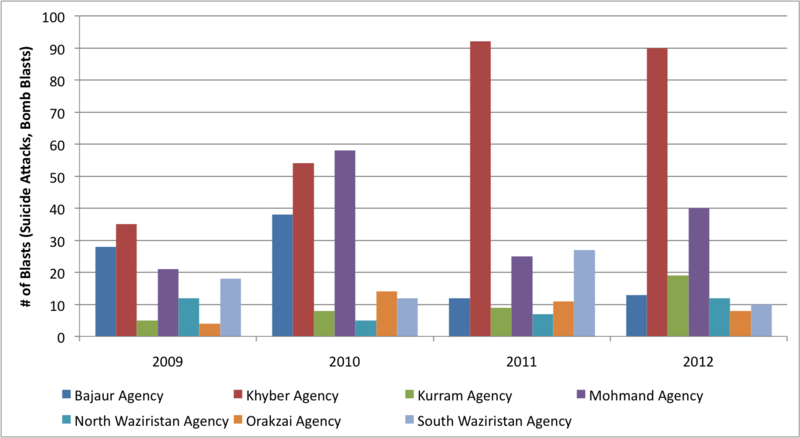 Numbers have spiked again in Upper Dir in 2011 where Taliban enter from Bajaur and Mohmand Agencies in FATA. We will look at such links at a later stage. In Figure 8 and Figure 9 we mapped the total casualties (due to blasts and armed encounters) and compared them to 2011. Upper Dir was especially heavily affected by armed encounters and blasts, while Mansehra solely by an increase in blasts. 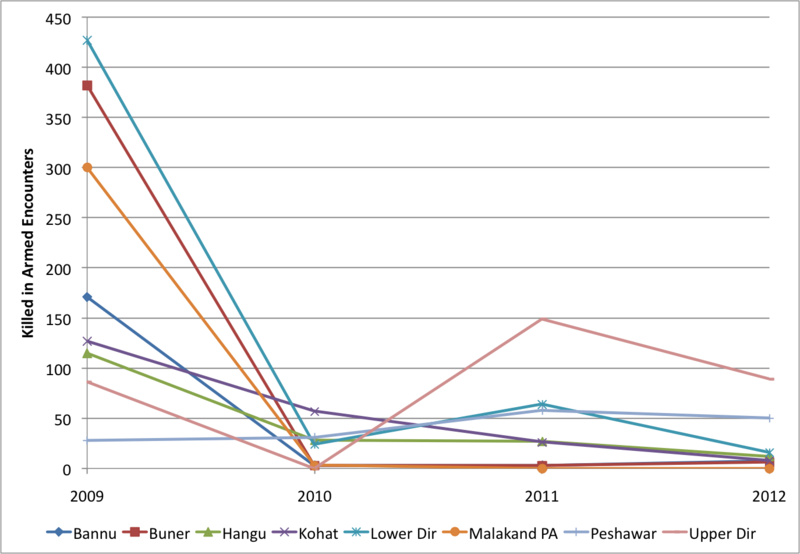 Both in Buner and Mardan casualties increased at a minor level, while the fact that all over the province casualties rather decreased points largely to how heavily they were affected in the year before. 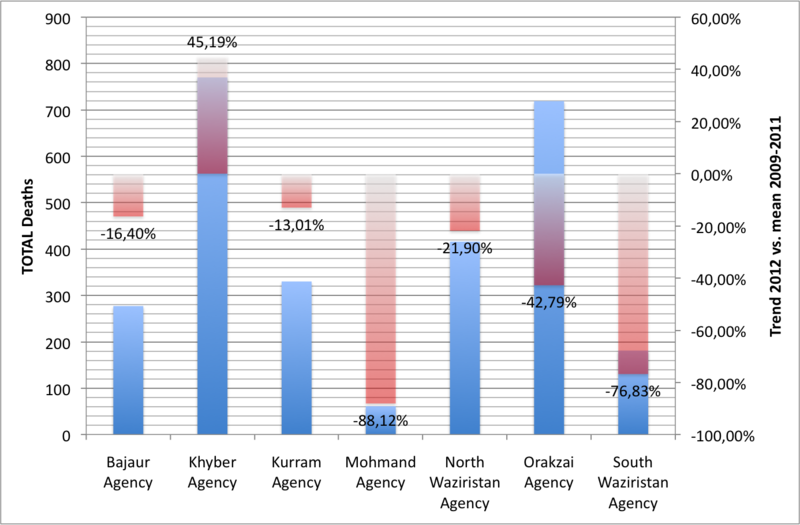 The impact of war in the FATA is quite different over the different agencies, and has changed quickly based on Army Operations in the area and the US drone policy, as well as the offensives of insurgents or Taliban factions. For the time being we are not looking at the FR in detail since relatively few events have happened there on an annual scale (see Figure 10). 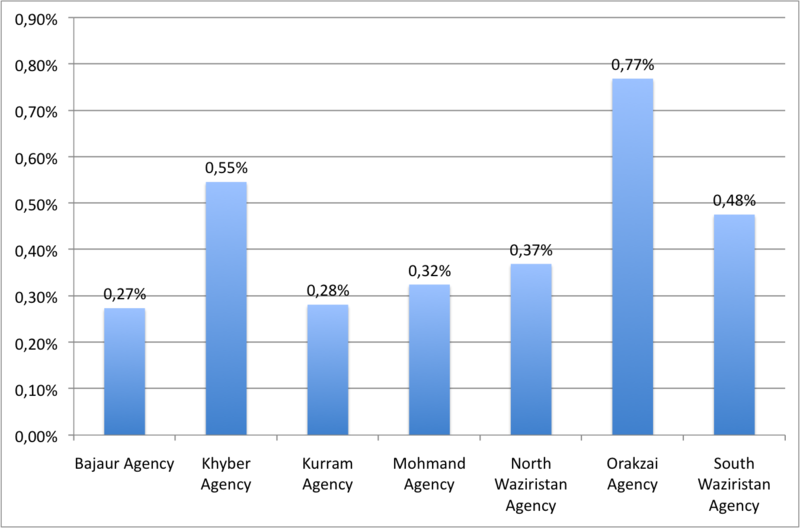 They are however part of the datasets and are an important area as a link between the FATA and the main KP province. This however is of more concern at the monthly resolution. 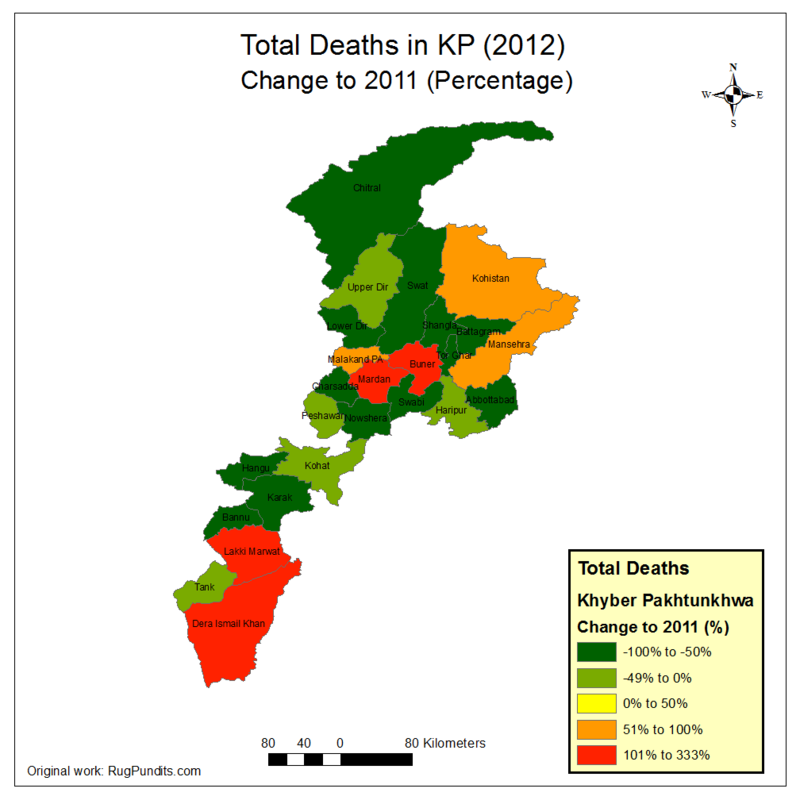 From Figure 10 it is obvious, that like in KP, the area close to Peshawar is most heavily affected when looking at the human lives’ toll. 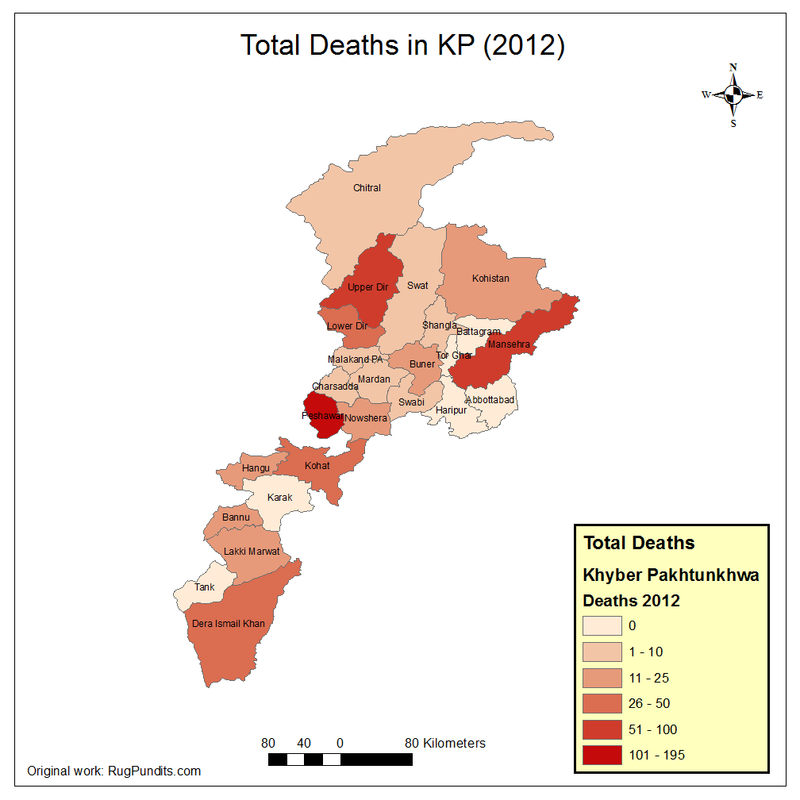 Khyber and Orakzai are both not part of the Drone War but heavily affected by blasts and Army interventions. 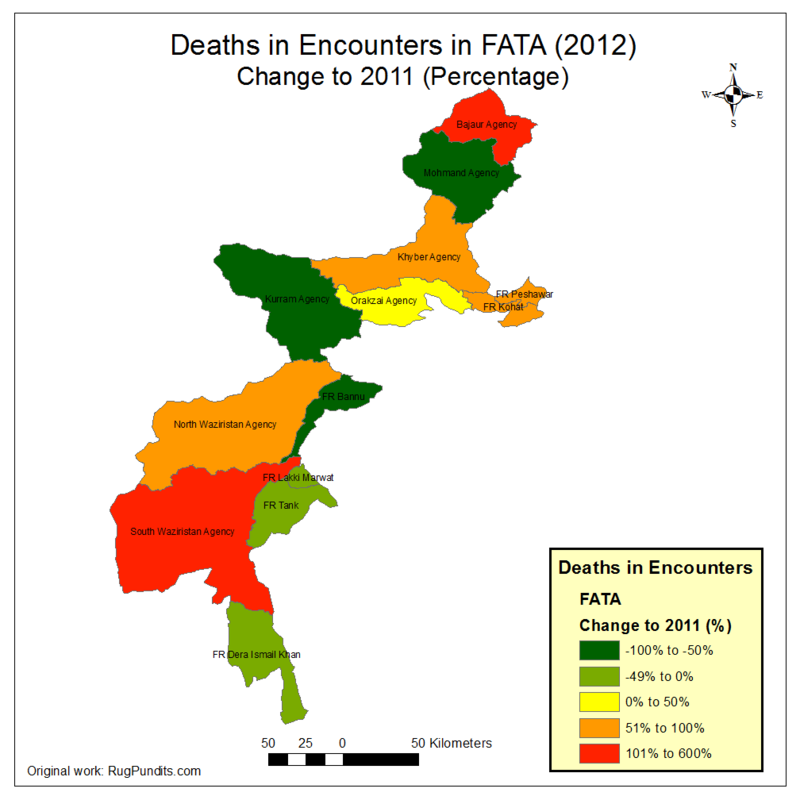 And contrary to all other FATA (except Bajaur), violence has been on the increase here (see Figure 11). So while in KP, it is rather the South that gets worse, it seems to be the other way around here, where Bajaur (adjacent to the equally worsening Upper Dir) is doing bad. 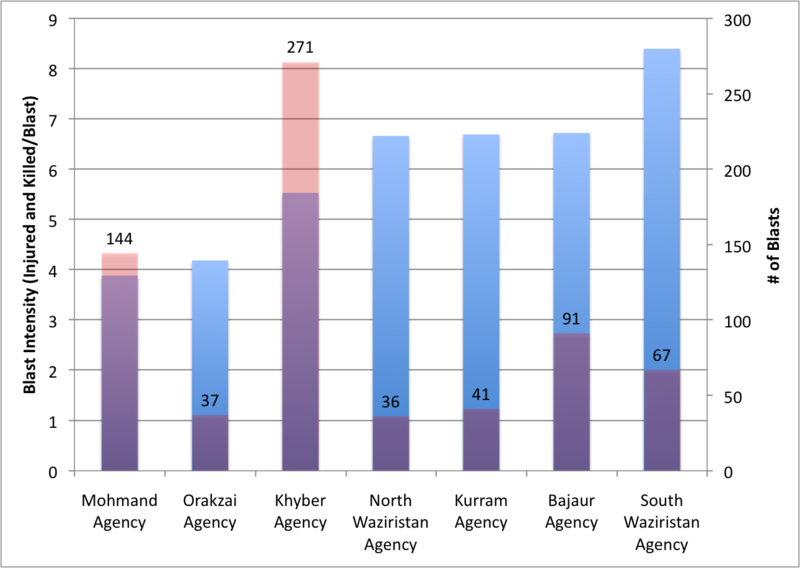 The most heavily affected Agencies by blasts are Khyber (271 blasts in 4 years, 505 people killed and 886 injured) and Mohmand (144, 261, 330) – see Figure 12. 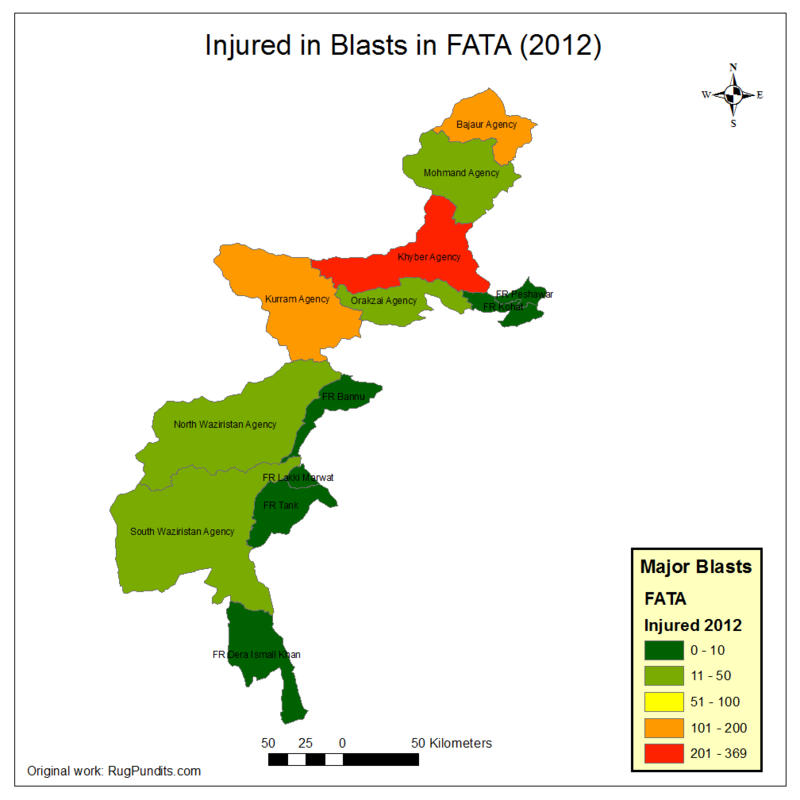 The blasts in the FATA were however generally of lower intensity than in the KP province (see Figure 17).Kurram and Khyber also have been affected most heavily in terms of the human toll (see Figure 14). 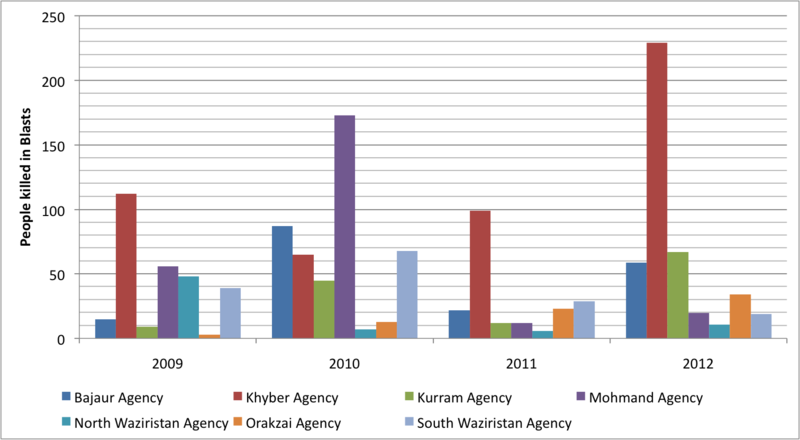 North Waziristan, the most heavily targeted Agency by the drone war, had the fewest blasts over the 4 years (see Figure 21). However at the same time, it has also been the least under attack by the Pakistani Army (see Figure 20). Without further insight one could make two rather opposed deductions there – either the Drone Strikes show effect, or there are simply fewer blasts because there is no reason for retaliating threats. 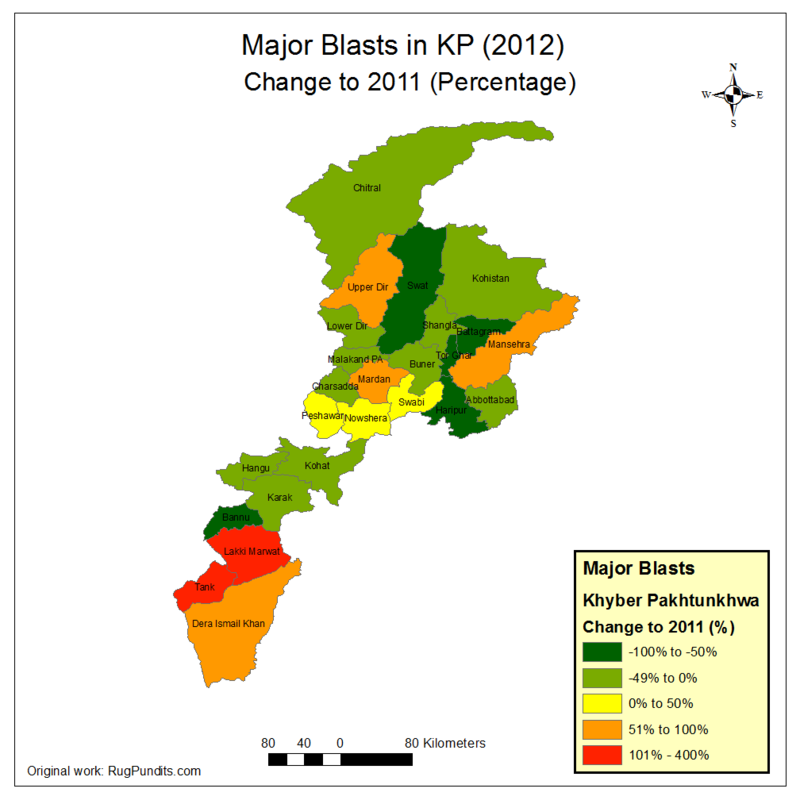 Khyber has already been worse in 2011 (see Figure 13), while there are two areas where blasts have increased heavily – the North and North Waziristan/Kurram. 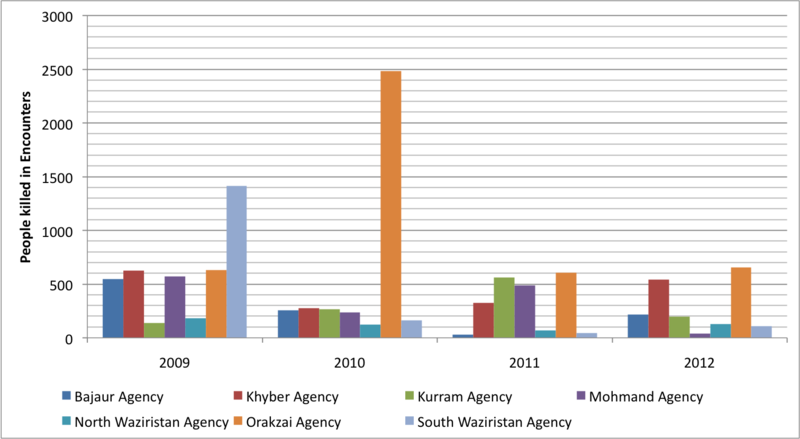 For the area of Khyber, Kurram and Orakzai a continuous increase of attacks is obvious in recent years (Figure 15). These are on the one hand areas heavily attacked by Pakistan Army (Khyber and Orakzai) and little heeded by the Drone War. 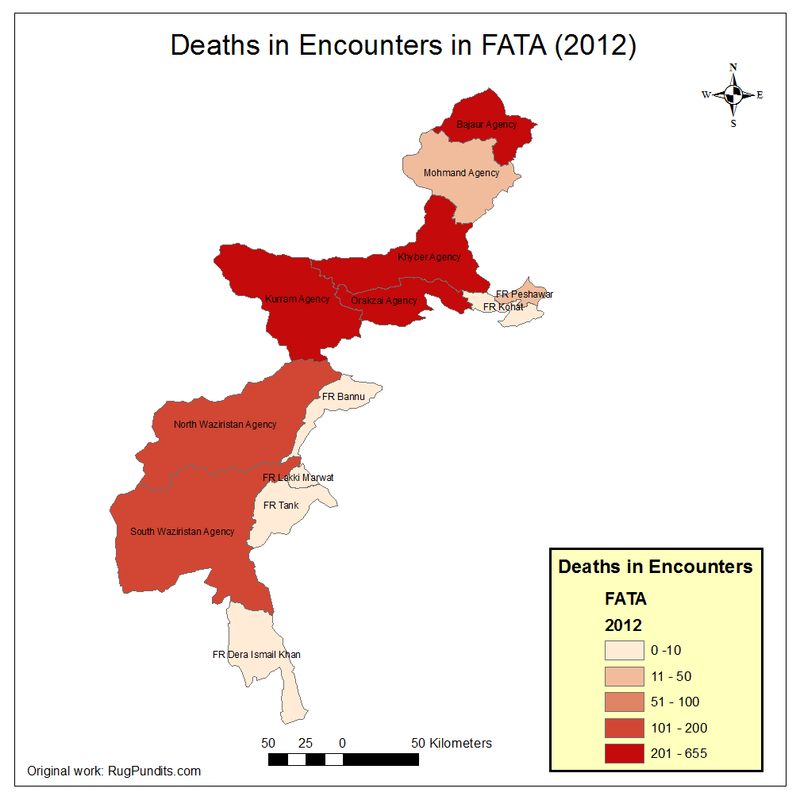 The FATA are compared to the state’s other provinces most heavily affected by armed encounters. In 2012 in 194 encounters 1926 people were killed and at least 433 injured. For Balochistan these numbers are at 50/317/89 and 35/241/77 for the KP. An overview over all Agencies is given in Figure 18, with changes compared to 2011 in Figure 19. Opposite to the Drone War, the Army Operations and attacks by militants on the Army are more focused on the Central Agencies as well as Bajaur. Already at high total numbers, the casualties have also increased in these areas compared to 2011, while the increase in Waziristan was on a minor scale. 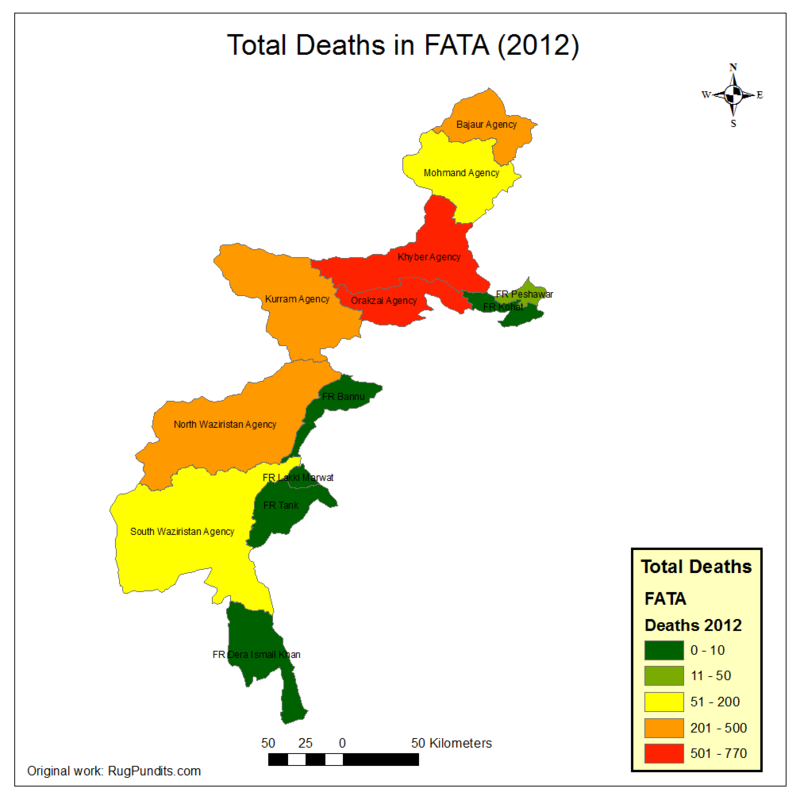 The high number of deaths in SWA in 2009 (Figure 20) is due to the Army’s Operation Rah-e-Nijat there. This was followed by an Offensive into Orakzai and Kurram in 2010 (Khwakh Ba De Sham) after militants had escaped North. In Mohmand the effect seems to have been a stark spike of attacks by the militants with over 150 people killed compared to 50 the year before, while army operations have decreased here, after the commencements of the Brekhna Offensive, which is officially still ongoing. Mohmand and Bajaur were used as corridors and safe havens during the war in Swat (Rah-e-Rast). Orakzai has since stayed a fierce battleground and being the staging ground for many attacks into the Peshawar region, operations seem to be of minor success there. The Drone war has largely focused on Waziristan (for a spatial analysis, consult Johnston’s recent paper), although all locals who have been executed by the Taliban for allegedly spying for the US were found in North Waziristan (with one exception in Mohmand). In Figure 22 we summarize blasts as well as drone strikes and army operations (indicated by their intensity, causing death) to see whether prevalent patterns can be made out. A rise in drone strikes seems to go in hand with a drop in attacks in most agencies. This is also true for Army operations where drone strikes happen less often. However in Khyber and South Waziristan, Army operations and number of blasts rise and fall parallel, suggesting that such operations rather escalate violence from the other side in these areas than disrupt them. 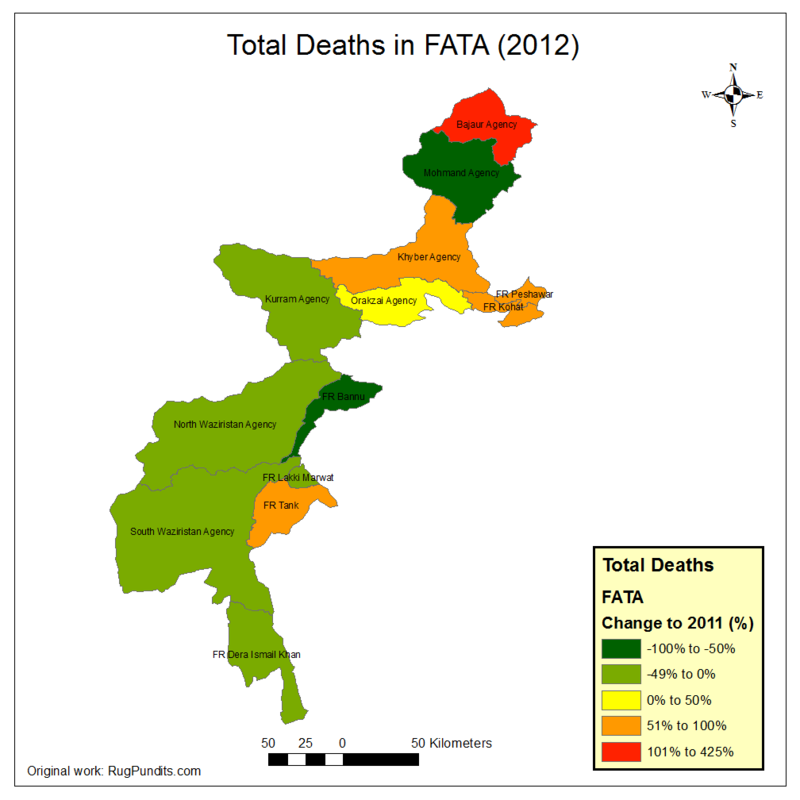 Finally we look at the total impact of the war on the population in the FATA. Again it is important to note, that these numbers should not suggest that these casualties were all citizens of the respective district. In many cases militants hail from somehwere else, so does Army personell. It however brings the scope of the war for such a comparably scarcely populated area in perspective. 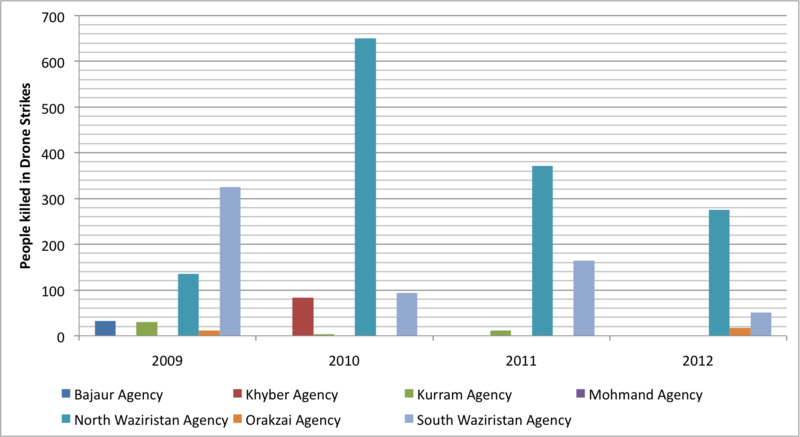 Khyber, with a strong increase in blasts and armed clashes has seen a rise in deaths, all other agencies were relatively less deadly – considering their absolute numbers in 2012, this however just shows how bad the years before were. 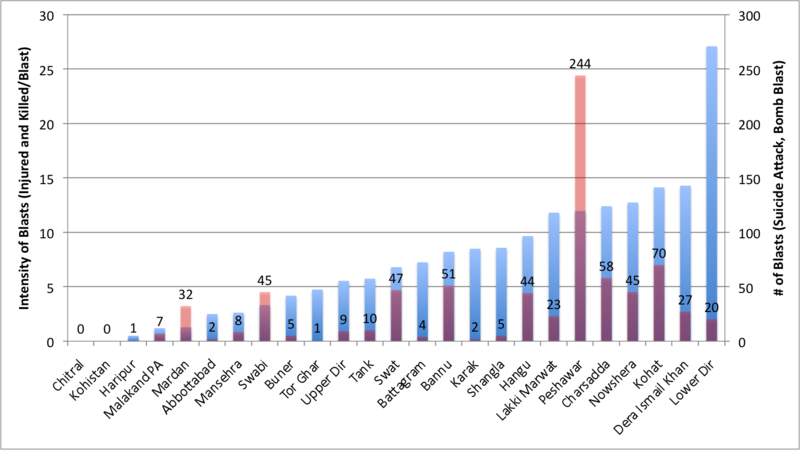 Comparing these numbers (all deaths and injured from 2009 – 2012) to the agency’s population (see Figure 24) one gets to nearly 1% directly affected of the total population in Orakzai Agency, considering that the absolute numbers do not include targetted killings, injured in drone strikes and other violence.